Ananka's Diary: Is This a 100-Foot Snake? Is This a 100-Foot Snake? Today is a banner day for giant creatures! 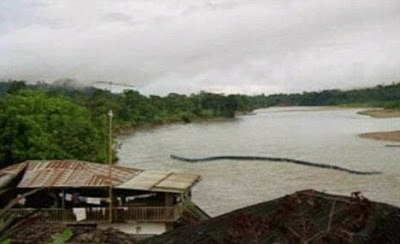 The Daily Mail (a British newspaper not necessarily known for its journalistic standards) has published photos of what appears to be an unbelievably large snake swimming in the Baleh River in Borneo. To be honest, I'm not at all convinced that Photoshop wasn't involved in the creation of these images. But some people believe that the beast shown is the Nabau, a mythical 100-foot snake god that's said to make the Baleh River its home. still, i looks like photoshop to me. The first picture looks so cool. I want to go over there right now and see for myself. someone with good knowledge of photoshop had to make this. anyway, it looks awesome. my photoshopping looks like a baby's next to this. That's so fake it's not even funny. the first one is real,the second one is fake.trust me. I've had practice in this subject. You can tell because in the first one the water actually shimmers. In the second one its just drawn in. But that is possible to fake,but if so this is a pro. This is for realz fake! Don't river gods have magic that prevent them from getting caught on film? I think it has been editted. But I'm not sure. Wow, even i could do that on photoshop! Would totally love to see it if it did exist though... Maybe next time i go to borneo i'll see it lol. maybe there's a snake (probably not) but I highly doubt that it's a RIVER god. that would be so cool though! We all knew it was coming. The day the world goes insane. (Like it wasn't already) Now the world won't believe anything! (I''m in that catergory) Do I have to dress-up as King Kong to get the message to you people? How do you explain UFO's then? Is it another fancy work of photoshop? wow. I havent been on here in forever. I was Kad before btw. and it looks like photoshop to me. btw everyone today one of my kittens died. My mom accidently ran over him with the car cause she dident know he was under there. I am super sad. 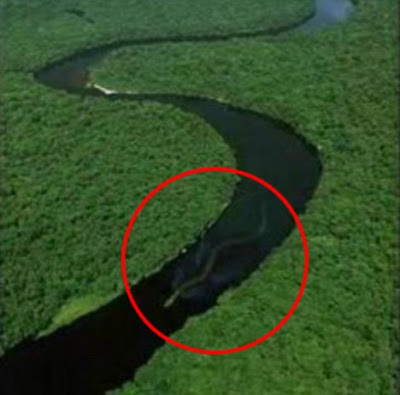 The two photos are waaayyyyy out of proportion, in the first pic the snake is about twice as long as the river is wide and in the second pic it doesn't even reach all the way across. The first one could be a speed boat with a very very long streamer attached, and the second one could be some inflated rubber tubing. I agree with Holly - besides, if you use blending tools, a couple layers, and were pretty good with your knowledge of photoshop, you could make that easily. i don't think it's a snake. it's a dragon! just kidding. i agree with Holly. the first one looks real though. what i noticed was that it was taken from far away, not close up. and it's blurry. that probably means it's fake. I do agree with Holly, though. Totally photoshop! But so cool how ppl believe things like this! I believe in 100 foot snakes, but I don't believe in these photos. There is tons of stuff we don't know about. We used to think that corals were rocks, the earth was flat, and that boys were better. you did capture the movement of snakes very well in the first one. I aplaud you. The second one is too straight though. A snake would only be straight if it was moving on dry ground and that one appears to be sitting. However, a 49 foot python was found in Indonesia this year. i'd thats 100% photoshop edited.